The Policy Council is the "CONGRESS" of Early Head Start. It is set up so that parents can learn and understand operations of the program. In each Early Head Start class, parents elect one representative and one alternate to represent them at Policy Council. Develops and approves the Policy Council budget using the funds allocated by the program for PC activities. These funds are generally used for parent education, center committee activities, and council expenses. Reports PC information to the parents at their Parent Committee Meeting monthly. Reports center concerns and activities to the PC. If unable to attend, informs the alternate so he/she knows to attend the meeting. The delegate and the alternate may attend together. All Early Head Start parents are eligible to attend each meeting. 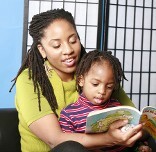 The Early Head Start parents elect officers annually. The offices are: Chairperson, Vice Chairs, Secretary, and Parliamentarian. The officers terms run from election date which is in September to the following August. How involved must I be? By attending the scheduled meetings monthly, sub committee meetings and any other call meetings, as well as being a decision maker. Monthly meetings are held the third Wednesday of the month at Luby's cafeteria beginning at noon. Parents are the first educators of their children and Policy Council will enable you to know what your child is doing, who is working around your child, and you will help this program be the best it can be!